In a self-centered world, we need to learn to reach out to others. Students need to learn about missionaries and their work but also understand that they too can be sharing Jesus right where they are. Teachers can incorporate this kind of worldview into their teaching of almost any lesson. Teachers Discipling Students to Reach Out? 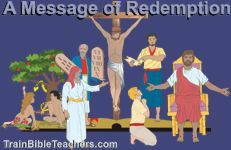 Article: Salvation Explained Through Romans Road Signs - Look for the link toward the bottom of this article for a page you are permitted to print to give to students as a tool for sharing the Gospel. This seven page teacher training worksheet helps teachers determine what constitutes spiritual maturity in regard to outreach and then think through at what level students appear to be with a view to helping them get to the next level.